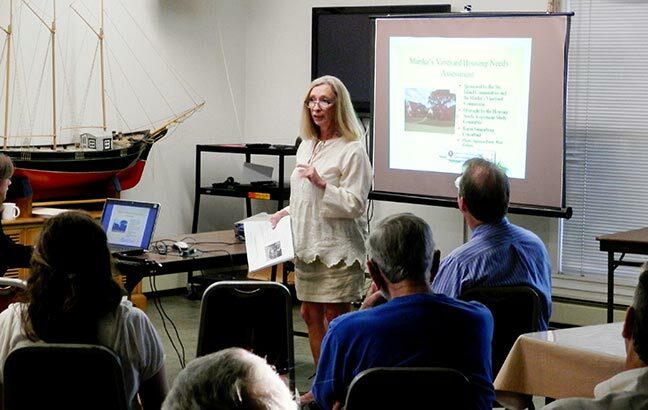 One year after its formation, the Martha’s Vineyard Housing Needs Assessment Committee officially presented a comprehensive report on Island housing needs at a meeting on June 19 at the Tisbury Senior Center. The report, prepared by housing and planning consultant Karen Sunnarborg of Jamaica Plain, describes an Island with a decreasing number of children and younger residents and an increasing number of older residents. Using slides to illustrate her points, Ms. Sunnarborg said there is an overall increase in the cost of housing with an ever-widening affordability gap between what a median income family can afford and the median price of housing. The 250-page report is expected to be available at the end of the month on the Martha’s Vineyard Commission website. The MVC was represented on the committee that also included representatives of the six Island towns and The Dukes County Regional housing Authority. Ms. Sunnarborg pointed out that the report shows there is increasing poverty on the Vineyard, with close to one quarter of all households earning less than $35,000 and an increase in the number of lower paying jobs in the service industry. Many lower-income people spend more than half of their income on housing, according to the report. She said that no more than 30 percent of income for housing is the goal of most affordable housing advocates. The report notes that there are approximately 5,000 seasonal workers on the Island. Charting housing needs, the report states that there is a dominance of single-family houses and a relative scarcity of multi-family housing with a majority of new housing units produced for seasonal use or as second homes. The rental market is affected by seasonal rentals with winter or year-round rents typically in the $1,200 to $2,200 range, often with high upfront cash requirements. While noting that there are two distinct house markets, high-end and low-end, Ms. Sunnarborg said that the median house sale price has increased from $535,000 in September of 2012 to $600,000 in March of this year. The report attributes the Island’s affordable housing problem to an average weekly wage that is 71 percent of the state average and a median home price that is 54 percent above the state’s. The Island median rent is 17 percent higher that the rest of the state. She said that local affordable housing projects have not benefited from the economy of scale as in off-Island communities, and hat donated and substantially discounted land prices have had a significant bearing on affordability. The report suggests establishing housing goals of 50 affordable units per year with an 80 to 20 percent split in rentals versus ownership and recommends taking advantage of the economies of scale, with higher density projects. The report follows a similar study, called “Preserving Community,” completed in 2001 and revised in 2005, which includes three major components, a housing needs data analysis, an analysis of organizational housing initiatives, and recommendations for addressing priority needs. Ms. Sunnarborg thanked the committee and all who helped on the year-long project. She said the report is the result of research and data from many different sources, including U.S. census information, market information, and information from the Island towns. She worked with information gathered from individual interviews with Islanders and meetings with community representatives as well as information from each of the towns’ assessors and building departments, Island public housing agencies, the Steamship Authority, and other Island organizations. The committee looked at effective strategies implemented in other communities as well. The MVC provided technical help. Ewell Hopkins, committee member from Oak Bluffs and co-chairman of Habitat for Humanity MV, told the Times in a phone call after the presentation, “the report is a good starting point. It has a lot of data. It was not put together by special interest groups. It is truly objective.” But he said that in order to utilize the data to produce results, “we need to ask the hard question ‘who are we serving? '” A question he said was not addressed in the report.